A 3-course dinner is included in the price with a minimum stay of 4 nights (water and coffee included, wines not included). Dinner must be used on the arrival day. A 30-minute massage per person, on the day after the arrival, according to the hotel availability. The Hotel Le Fontanelle overlooks, like a large panoramic terrace, on one of the most fascinating views of the Tuscan countryside. Surrounded by lush vineyards and olive groves, secluded in an exclusive corner of the valley of Chianti Classico, it enjoys an enviable position. Ideal for those looking to getting away from the fast-paced world we live in to indulge in pure relaxation, not missing the chance to visit great cultural attractions and have great gastronomic experiences. 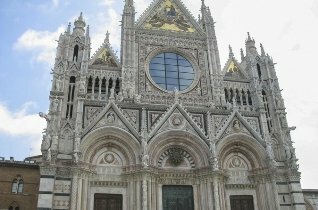 In fact it is located only 20 km from Siena and 80 km from Florence, offers the opportunity to discover the charm and richness of the Italian Renaissance. The property is an ancient country estate, which central structure dates back to the thirteenth century. It takes the name from its ancient sources of stone used to collect water from a spring, which have been preserved until today. The wise renovation of the residence has revived its ancient architectural splendour without losing sight of certain details and surely paying attention to provide all the modern amenities. The stone facade is in harmony with the surrounding nature, while the interiors are bright and furnished in typical Tuscan style. The Hotel Le Fontanelle is divided into several floors and consists of a main building where we find the reception, the restaurant, the bar, the swimming pool and small spa. The furniture has been accurately chosen to make comfortable every corner of the hotel. For example the common areas of the house are very cosy and invite the guests to relaxation in front of the fireplace or in the private library of the villa whilst reading a book of the vast collection. This small hotel discreetly won a favourable position among the hotels in Tuscany, finding its niche among the properties where you can still spend holidays completely abstracted from everyday life and reconnect with a natural primitive dimension. The 25 rooms of the Hotel Le Fontanelle are divided in different categories: Classic, Prestige, Deluxe, Junior Suites and Suites, located in the first and second floor, some overlooking the pool, or the vineyard or the forest. 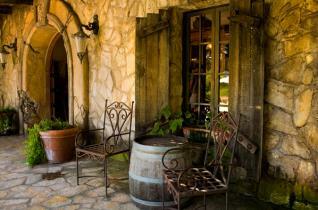 All are decorated in a charming Tuscan style and feature ceilings with wooden beams and terracotta tiled floors. These are characterized by great style where simplicity and elegance blend to form bright and warm environments in which to enjoy of a familiar harmony. All are equipped with modern comforts such as safe, hairdryer, satellite TV with LCD screen, wireless internet, minibar. The exclusive restaurant "La Colonna" offers typical dishes of the Tuscan and Italian cuisine with the attention to detail and the presentation of the dishes which is typically international. The taste of food is enhanced by a careful selection of fine Tuscan wines expertly proposed by the Chef. The dining room, decorated in Tuscan colours and soft lighting, creates a charming and intimate atmosphere where you can enjoy a very romantic dinner. Moreover, the hotel features the panoramic Belvedere Terrace of Colonna Restaurant, which is set for dinner during the summer season, from where you can admire the breathtaking view over the magnificent valley of Chianti: precious moments of peace that only the Hotel Le Fontanelle can give you. Reception 24-hour; Concierge service; free Wi-Fi available throughout the hotel Le Fontanelle; Wine/Gift shop where you can buy olive oil and wine produced on the estate; Vespa rental, free, private and covered garage; free use of mountain bikes; guided tours to the botanical garden of the hotel; free shuttle service to Siena centre at fixed hours (to be booked in advance, valid after the check-in). Nature lovers can spend their time on a mountain bike or take long walks on the paths around the villa and thereby discover the beauty of the surrounding countryside. 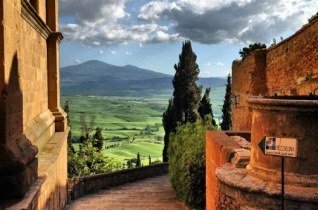 Lovers of good food have at their disposal a range of food and wine tours and tasting organized in various wineries in the valley of Chianti. For those who want to be pampered by different wellness treatments, the hotel offers a panoramic outdoor swimming pool, indoor heated pool with Jacuzzi area, sauna, the Turkish bath and large windows overlooking the breathtaking panorama of the surrounding valley. The gym with “Air Machine” equipment combined with massages and beauty treatments complete the offer at the Hotel Le Fontanelle, where the physical and spiritual regeneration of your body will be the natural and spontaneous consequence of a stay in this corner of paradise. Tourist tax – The municipality of Castelnuovo Berardenga requires the payment of € 4,00 per person/overnight for the first 4 nights stay (excluding children under 13 years) to be paid on spot. *NB: The services may not be fully available / working and subject to change for reasons beyond the control of CharmingTuscany.com who declines every responsibility. Minimal chic rooms, located in the annex building or on the first or second floor of the main building. An intimate and refined atmosphere is given by the visible wooden beams of the ceiling, the Florentine terracotta floor and the elegant wooden furniture of the Tuscany sober style. Every room has flax linen bedding. 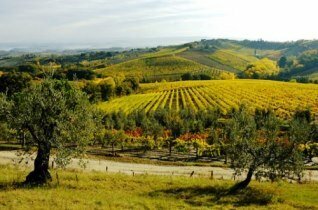 Enjoy an amazing view on the Valley of Chianti or over the Hotel’s vineyards. On request are available two connecting rooms or side to side rooms. Double room located in the annex building close to the outdoor pool area with a small garden surrounded by an hedge. The rooms have maintained intact the strong Tuscan identity, remaining tied to the past with modern comfort. The ceiling has visible wooden beams, the floor is original Florentine terracotta, and they show a quality wooden furniture proper of the Tuscany sober style. All rooms have flax linen and a DVD player is on request. View on the garden or the wood. This double rooms are located on the first or second floor of the main building and some offer a four-poster bed. The rooms have maintained intact the strong Tuscan identity, remaining tied to the past with modern comfort. The ceilings have visible wooden beams, the floors are original Florentine terracotta and furnished with quality wooden furniture of the Tuscany sober style. All rooms have flax linen bedding and a DVD player is available on request. The view goes on the garden or the wood. Homey rooms with sleeping area and living area. The Junior Suites are located either on the first floor of the main building with balcony or in the annex building on the ground floor with balcony or terrace. The atmosphere is typical of a farmhouse, given by the wooden beams on the ceiling, the original Florentine terracotta floor and the quality wooden furniture of the Tuscany sober style. All rooms have flax linen bedding. The view goes either on the garden, the Chianti’s Valley or the vineyard of the hotel. The Suites are located on the ground floor of the annex building with a lovely private garden, equipped with sun loungers, table and chairs. The Suites offer two separate rooms, a cosy bedroom and a homey living room. The atmosphere is typical of a farmhouse, given by the wooden beams on the ceiling, the original Florentine terracotta floor and the quality wooden furniture of the Tuscany sober style. All rooms have flax linen bedding. The view goes either on the Chianti’s Valley or the vineyard of the hotel. 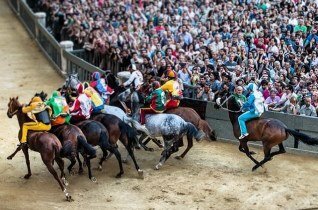 What is the "Palio di Siena"?